Cutting tools are by their nature consumable; they wear until they are no longer effective. A traditional approach to metal cutting tool management employs wear analysis alone, focused on manipulating tool materials, geometries and application parameters to improve part output and tool life in a selected operation. Maximizing the efficiency of a facility’s entire manufacturing process, however, involves consideration of a broad range factors in addition to tool wear. It is essential to examine cutting tool wear or, more broadly, tool deterioration, in light of the overall or “global” manufacturing process. Study of tool wear usually is limited to a single tool employed in a specific machining operation. However, to gain maximum benefits, it is essential to examine tool wear or deterioration in relation to all tooling in a facility’s manufacturing processes. 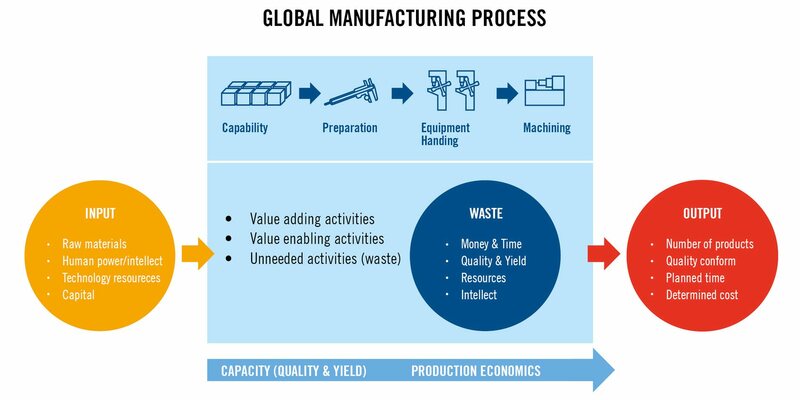 The manufacturing process begins with acquisition of raw materials and planning that involves utilization of human intellect, technological resources and capital investment. The process advances through value-adding and value-enabling activities but may be restrained by waste-producing events that result in the loss of money, time and intellectual resources and consequently reduce part quality and yield. Output is measured in terms of part quality, the quantity required and desired production time and cost. 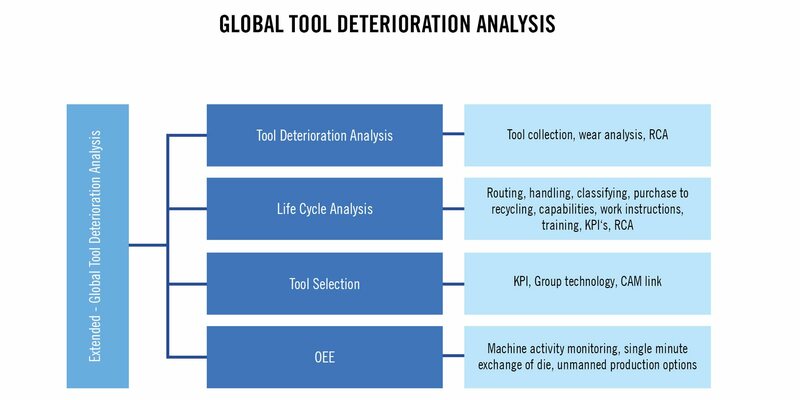 Global tool deterioration analysis supplements initial measurement of insert edge wear with analysis of the tools’ role in Cost of Goods Sold (COGS) totals, Single-Minute Exchange of Die (SMED) analysis, Value Stream Management (VSM) results and Overall Equipment Effectiveness (OEE) percentages. 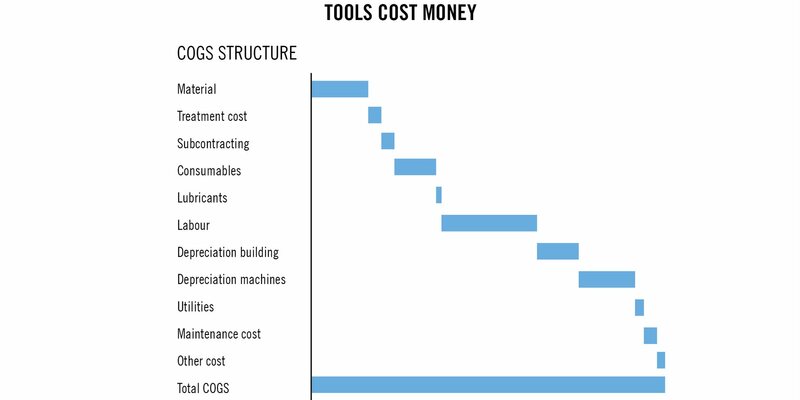 The most basic tooling-related economic consideration is clear: tools cost money. Figure 4 presents the cost of various elements of the machining process and totals them as COGS. This data enables a shop to compare and contrast the various elements of production costs, with an eye on finding candidates for cost reductions that will boost operational profitability. Seco Consultancy Services continually analyse ongoing manufacturing evolution and has developed its “NEXT STEP” production model to deal with the continual changes in the manufacturing industry. The NEXT STEP model is based on the four key standards of machining, namely cost efficiency, time efficiency, quality and yield. Next Step enables manufacturers to set and meet machining standards for themselves through analysis of waste production, machining process technology, tooling and workpiece material science, production economy and yield, and the critical role of people and leadership in their operations.